Mix the cider, rum and schnapps together in a large pitcher. Add the shaped ice cubes. You can make this in a large punch bowl for parties just doubling the recipe. 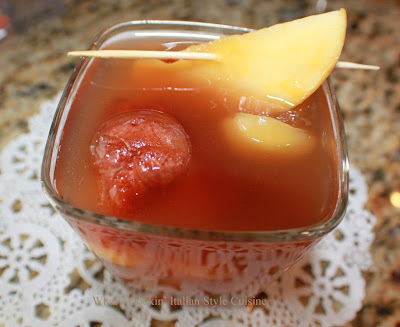 A nice garnish on the glass would be a sliced apple dipped in caramel with a skewer. What a fun, delicious autumn cocktail! And such cute ice cubes :) Hope you've had a nice weekend!!! This sounds yummy. I never knew they made cinnamon Schnapps. I can think of so many recipes to use it in. Those silicone Halloween I e trays are adorable. What will they think of next. Naughty but nice twist to give delicious apple cider a kick! Hi Claudia, sorry I'm late in commenting, miss so many of your posting. Lovely silicon ice cube tray, so cute! The cocktail look refreshing.